There is so much wrong with what the VP said in this interview. Let’s start by agreeing that the man is not stupid or he wouldn’t be VP. And if he is not stupid, then we should never dismiss anything he says as incompetence – because it isn’t. At the level of the Presidency and Vice Presidency, there is no such thing as incompetence. There may be a different agenda at work that makes what they say and do seem to be the result of incompetence, but if you look to what they are actually doing and try to understand to what purpose they do it, you’ll find they are actually very competent. So, why would VP Biden say these things? Well, let’s start with the easiest and most obvious reason: to ridicule anyone who buys a gun but never goes hunting. First of all, this is a fallacy. It is both “against the man” (also known as ad hominem) as well as an “appeal to popularity.” What Biden is doing is trying to convince those listeners who do not own a weapon that those Americans who do not hunt have no legitimate reason and/or are unqualified to own a weapon. But he is also trying to use the public pressure he and his partners in the media create or present as being real even when it isn’t (remember, this was on MSNBC) to shame Americans who do not hunt into not buying a weapon. The truth is, the majority of Americans oppose gun control. But many Americans don’t know this fact because they get their news from the legacy media and that media agrees with and is cooperation with this Administration to advance the gun control agenda. In short, Biden and the legacy media are participating in propaganda: knowingly telling a lie to advance a political agenda. Pick the target, freeze it, personalize it, and polarize it. In other words, do exactly what Biden is trying to do to gun owners who do not hunt. Now for the most damning part of Biden’s comments: they are intended to subvert your constitutional protections and trample your Natural Right of self-defense. What’s more, Biden knows this, but he doesn’t care. He does not believe in the original intent of our founders, and that means he does not believe in or support the Constitution nor the rights it was intended to protect. In fact, if you listen, Biden believes your rights come from government, not our Creator. This is Hobbesian political thought and is 180 degrees out of phase with the political thinking of our founders, which centered on individual rights and liberty. So, which use of the word did our founders mean? The answer is obvious – to anyone who knows the history of our founding, that is. The founders clearly said that the militia is the whole body of able-bodied male citizens. This is further evidenced by their delineation between the militia and the army in their writings. They said there is a difference. Finally, we have the minuteman. Who was he? He was the guy next door, and he was the militia. So the 2nd Amendment starts by openly declaring that an armed populace is necessary to the security of a free state. What’s more, Biden knows this. Remember, he’s not dumb; he just rejects the founding principles and ideals of this nation. Next, let’s look at the word arms. The founders did not specify what type of arms they said the people have the right to own. At the time they wrote the 2nd Amendment, the term typically referred to any and all weapons of war – up to and including cannons. What’s more, we know from historic records that many wealthier private citizens actually owned cannons. They used them in the Revolution. Yet, there is no record of the founders or earliest courts ruling that the people did not have the right to own these weapons. Therefore, we can assume that the founders did not mean for the 2nd Amendment to be restricted to pistols of less than seven rounds, rifles of less than ten rounds and shot guns. They meant that the people were to be allowed to own the weapons of war, and here’s where we break with the principles of liberty. With the sensationalizing of mass shootings by our complicit media, the public is cared of the idea of anyone owning a machine gun, but people do own them. Up until the 1920’s, anyone could own one and, save for the shootings connected to the gang wars, there were very few incidents involving a machine gun or fully automatic weapon. Furthermore, the media doesn’t tell you that, while some 7-10,000 people die from gunshots every year (including those who are killed by police or by their own hand), it doesn’t tell you that guns are used – by private citizens — to stop a crime and/or save a life more than 2 million times every year. The truth is our founders recognized that we have a Natural Right to defend ourselves, and that includes defending ourselves against our own government when it becomes tyrannical. And yes, our founders said “when” our government became tyrannical, we would have to set it right again. 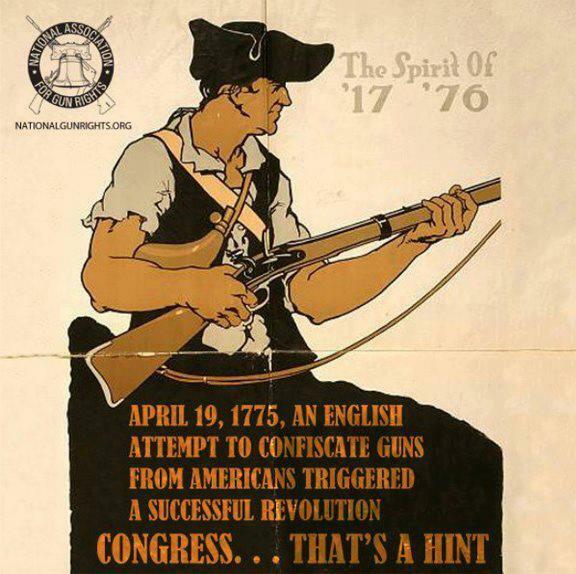 Given that they declared this right in the Declaration of Independence, that they exercised it to free themselves from a tyrannical government and that they deemed it necessary to protect it as the 2nd Amendment, it is wholly unreasonable for anyone to argue that the founders intended to restrict our right to keep and bear arms only to those weapons necessary for hunting and nothing more. That would be totally out of keeping with our founder’s character, history, and words. Nobody ever said being free is safe. But when did it become “safe” to be a slave? Make no mistake: there are only two options in life. You either live free, or you live under the control of others. You’ll have to make up your own mind which you prefer, but as for me, I chose to live free or die. THANK YOU FOR THIS POST. This is no new information to me, but I have been waiting for somebody “pro-gun” to finally define militia among other things, and setting foot down the path of clarifying the 2nd Amendment. I don’t know why in the hell nobody else has been undertaking this seemingly simple task since anti-gun inflammation has been taking the hot seat. Very informative articles, even though I am quite familiar with the Constitution and Declaration of Independence, have to be better informed with the Articles of Confederation, etc. I agree with your definition of the Second Amendment. I TRULY believe that if my neighbor wanted to keep an Army Tank in his garage, I would be over every day to look at it. I don’t believe there should be any law or policy to restrict ANY type of weapon. There are people who own devices that are more dangerous than guns that are perfectly acceptable by society. I agree. Only one point of contention. 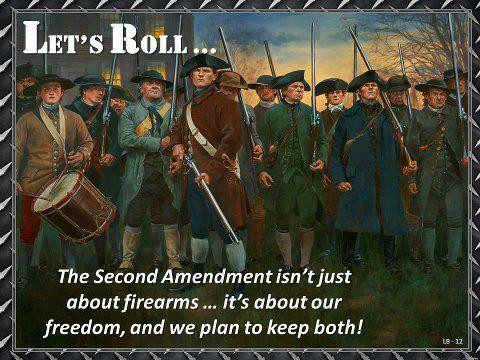 This is not “my” definition of the 2nd Amendment. It is the founders’. They said so — often and clearly. They are VERY different. We all have a natural right to defend our life, liberty and property. This is the use of force, in a defensive capacity, and is always within our moral rights. Violence is action taken against another that violates the rights of another. Notice the root of the word – VIOLence, VIOLate. Violating rights is violence, and nobody has the moral right to commit violence. We never have a right to commit violence. It is a Wrong. And yes, violence is offensive (in both senses of the word). Thanks for reading my blog page. I’ll be adding to it again soon. I’ve just been busy running a one-man business and trying to teach some classes in my church. They have been eating up my blogging time the past few months.